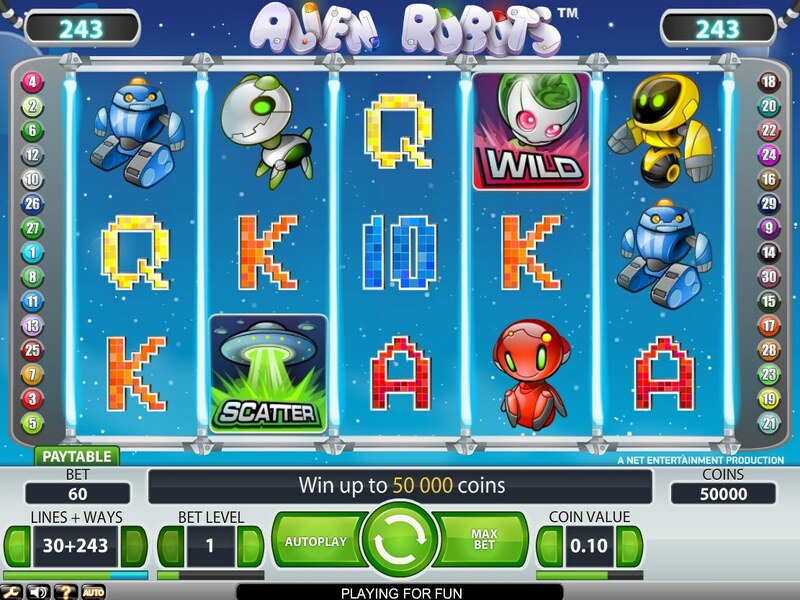 If you're a fan of Pixar's superb animated film, Wall-E, with its mix of aliens and cute robots, you should get a real kick out of NetEnt's slot, Alien Robots - a mix of, erm, aliens and cute robots across 5 reels. With a system accommodating fans of 30 paylines or the 243 ways to win system (Alien Robots uses both) the slot is pretty enough to look at, but sadly lacking is Net Ent's customary animated flare. Don’t get me wrong - the symbols are well-rendered, with a wide array of interesting robot figures. We get a cute Wall-E style red robot (the top payer, awarding a tasty jackpot of 10,000 coins), various robot friendlies, plus a UFO and some old-school pixelated 10-through-Ace symbols. Look out for the UFO symbol in particular, as three or more of those across the reels triggers a free spins round with up to 50 free spins up for grabs. The Wild symbol, meanwhile, is the green alien, substituting for all symbols other than the Scatter. Acting as a conventional Wild during the base game - so far, so boring, during the free spins round it takes on a new lease of life, becoming Sticky and also expanding to fill the whole reel. After a re-spin, Expanding Sticky Wilds revert back to being normal Wilds. 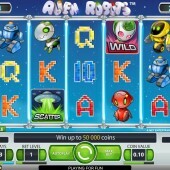 If you've ever enjoyed the 3D loveliness of Sheriff Gaming's sci-fi-themed slot, The Robets, with its scenes of domestic bliss - a husband, wife, pet dog - but all of them being robots, you'll probably enjoy Aliens and Robots. If you want something a little more bombastic, however, check out Playtech's big-money film tie-in, Cowboys and Aliens, based on the Daniel Craig Hollywood blockbuster. As for Aliens and Robots, there's not much in the way of animation or music - other than some simple spacey sci-fi sound FX - but the main draw here is the 243 ways to win system. It gives you the choice of playing 243 ways or a more standard 30 paylines, and there's an interesting use of Wilds too. If those don't float your boat, you may want to look elsewhere.